St. Paul ‘s Anglican Church, Bushville, is known as the mother church of all Anglicans along the northeast region of New Brunswick . It is the earliest example of a building constructed by a noted Miramichi builder, William Murray circa 1822-1823. The first church services for the Chatham Parish were held at St. Paul ‘s on Christmas Day, 1823 with the Rev. Samuel Bacon as the rector. There are records of baptisms and burials dating back to 1822 and marriages to 1833. 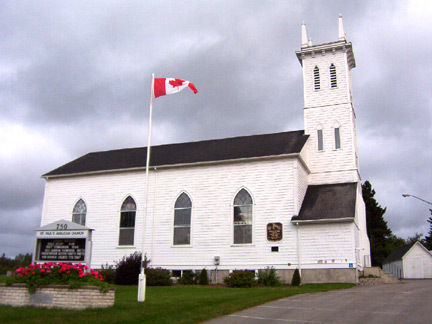 During the Great Miramichi fire of 1825, this church escaped the disaster sustained by much of the region and in 1826 it was consecrated to the Glory of God by Bishop John Inglis of Nova Scotia . Much history surrounds the church and the cemetery. Notably, one of the original Fathers of Confederation, John M. Johnson, is buried in this cemetery as are two children of Joseph Cunard the founder of Cunard Shipping Lines. Possibly the best known in the region is the untimely death and burial of a courageous local doctor, Dr. John Vondy. Although born in the region, he received his medical training in England and returned as a physician/surgeon to the Miramichi to practice. During the famine in Ireland many ships carried immigrants to the region. Most of these passengers, including those on the ship “Looshtauk”, were sick with typhus fever when they arrived and these passengers were quarantined on Middle Island near Chatham . Dr. Vondy was the only physician with the courage to live on Middle Island and to treat the sick. He, in turn, succumbed to the same disease and died at 28 years of age. His memorial in the church reads: “ Immigrant Doctor Monument . This memorial was erected as a public testimonial of respect to the memory of J. Vondy, Esq., Surgeon, who in the faithful discharge of his professional duty, fell a victim to malignant fever which prevailed on Middle Island among the passengers of the ship Looshtauk. His remains were interred in this burial ground July 2, 1847 .” His example of courage and caring is still a motivating force in the Miramichi today. Thomas Peters is also buried in the cemetery of St. Paul ‘s. He was the first Judge in the region of the Miramichi and his home is now the Miramichi Golf Club. The church stands as a testimonial to the graciousness and witness of the Gospel of Jesus Christ in a time when much comfort, courage, outreach and commitment is needed in the whole community. The first church services for the Chatham parish were held at St. Paul ‘s Church, Bushville on Christmas Day, 1823, with Rev. Samuel Bacon as the rector. Construction of St. Mary’s as a ‘Chapel of Ease’ in the town of Chatham began in 1836. Work was completed in time for the first services on December 31, 1837. In 1894, St. Mary’s Church was renovated and expanded with Bishop Kingdon dedicating the remodeled church on August 7, 1895. Unfortunately, it was destroyed by fire on January 12, 1964 when the Rev. L. M. Pepperdene was rector of the parish. A new building was begun in 1970. Archbishop A. H. O’Neil dedicated the new St. Mary’s on April 19, 1971 and the church was consecrated by Archbishop H. L. Nutter on the Feast of Saints Simon and Jude, October 28, 1981. Renovations were completed in 1999 to the front entrance of the church to create a new interior stairway as well as an elevator. Two beautiful old stained glass windows from the former Sunday School Hall were also incorporated into the addition. 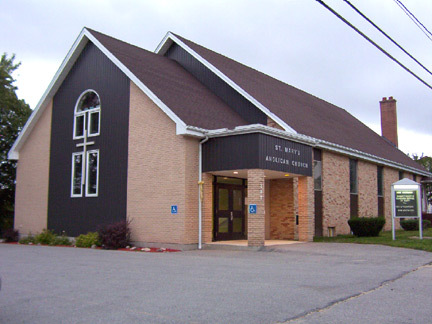 Bishop George Lemmon blessed the addition at a service held on November 21, 1999. The lift was dedicated in memory of Walter Brown on November 26, 2000.